I'm with you, Ashley. I have a girl, and am equally unimpressed with the selection. The August issue of Good Housekeeping has a great article on the best kids clothes for back to school. 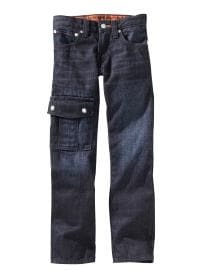 The best jeans for boys were actually $10 from Kmart. They looked at construction, wearability, washability, etc. No kidding! I hate cartoons, etc., on clothes. Have they gone mad? Or are they completely out of touch with their customers? Wow I couldn't agree more! I stop in everytime I am near their store and NEVER seem to walk out with anything anymore. Not sure what they were thinking this year. I can never really find anything there that is worth the money. I like Gymboree... but it isn't as great for boys. I forgot - here is the link to the article. I too have issues with stupid t-shirts that have obnoxious phrases on them or cartoon characters. Seems like every store in the universe is jumping on that annoying bandwagon. I got so frustrated last year that I bought my daughter's ENTIRE summer wardrobe from Land's End and L.L. Bean. They have really great sales, and the quality is very nice. Back to school time at Target is also good because of their school uniform section. Nice classic pieces. I might be the boring mom, but I can't stand the thought of letting my little 5 year old wearing a t-shirt that says "Spoiled Brat" or anything that looks like a spray painted train car. What ever happened to nice clothes? I stopped shopping at the GAP a long time ago. Their prices are ridiculous considering that their clothes aren't as nice as they used to be. I am also not a fan of character t-shirts or sports themes. That's been a real problem for me while shopping for this little guy I'm preggo with. MY husband doesn't understand why I won't get anything sports related, but I don't want to pressure my baby into being a jock or choosing one sport over another. What if he turns out to be a band geek just like his dad? As for the "band geek" I've seen some pretty cool shirts with music themes, but again, my son won't wear those either. I had a terrible time when I was pregnant with my son. Everything had a "theme" or character or something slapped across the front. Why can't they sell nice basic pieces that mix and match. LL Bean and Land's End are great sources for these types of items. Land's end is having a good sale right now. coming from someone who works at gap, i will say the stuff at gap kids doesn't particularly ever thrill me. i feel like our stuff in baby gap is way cuter. is big kid still able to wear a 5T? i think you would be able to find stuff for him in baby gap that you liked better if he's still able to fit. also, if you would like i can email you one of my friends and family invites- it starts july 30 and goes through august 2 and it's good for 30% off at all our brands (gap, old navy, banana republic, piperlime, and athleta) in-store and online. Aww...I liked the GapKids girl stuff. I just spent a bunch there since this was my daughters first season where she is able to fit in it all. But I agree...the boy styff was not cute. Boys always get the raw deal in the close department. I was noticeing that Old Navy is big on the character shirts also and that just bugs the crap out of me. Target has been doing better in the boy department lately, I just hope this years clothes shopping isn't a complete nightmare! Only good thing is TN offers a sales tax Free weekend and our sales tax is crazy high.